In my last post, I talked about the very general history of aquaculture and especially the farming of fin fishes. Of course, shell fish aquaculture is a bit different, and it diverges pretty rapidly based on this post. Because I'm going to be talking about feeding fin fishes and crustaceans (but mostly fin fishes)- the conversation is different with shell fish because they are filter feeders. So we're going to talk about farming fin fish and a pretty interesting food web that links massive centers of fish farming with far flung fishing fleets and your table.And we're going to start with an important question: what should farmed fish eat? The process of farming fish, also known as aquaculture, is quite old. The earliest aquaculture (see the last post) utilized natural formations to trap fish in areas for easy access; this meant a relatively small and seasonal system that left the fish capable of finding their own food. Other traditional forms of aquaculture use symbiotic relationships to feed larger amounts of fish. As early as 220 AD, rice farmers in China began to introduce fish into rice patties, either concurrently in rotation with the crop. The fish, usually tilapia or carp, feed off of pests or weeds but not the rice plants; in return, they fertilize the soil to increase the rice crop. In this way, large amount of fish can be farmed without worrying about what the fish eat. However, industrial aquaculture in the 20th century presents a challenge: how do you effectively feed a large amount of fish in close quarters? To make fish farming possible, and eventually lucrative, aquaculturists needed to work out two things: what nutrients were vital for the production of healthy fish? and what is the cheapest and most consistent way to achieve that nutritional balance? Researchers at the United States Bureau of Fisheries began working on industrial aquaculture in the late 19th century. They focused primarily on marine fish and crustaceans (particularly lobster) at their Woods Hole marine station, and worked on the culture of fresh water fish and shellfish (mussels to provide mother of pearl for the button industry). At the Davenport station, Myron Gordon and G.C. Embody became interested in how best to feed trout after a series of trout die-offs and diseases, in particular, goiter in trout. In 1924, they began compiling data on what trout ate in the wild and their general metabolism. Some of the earliest data came from field studies by Juday and Birge (the rock stars of the Wisconsin limnology community and possibly the two most important figures in American freshwater ecology in the first half of the 20th century) and metabolic studies by Morgulis at the New York Aquarium. After crunching this data, they came up with a general breakdown of nutrients that sustained trout and analyzed the effectiveness of current trout feeds. The accepted fish feed for captive trout during this period was cow, sheep, and pig organs. Previous researchers found that shifting the quantity of these feeds didn't seem to have any impact on the health of the trout-- it didn't matter how much they ate, they continued to get sick. Embody and Gordon's research found that these food sources didn't contain enough of the nutrients found in the natural diet of the trout and suggested aquaculturists should find other forms of fish feed. They didn't make suggestions about what that feed should be, but their charts show a clear leaning towards fish meal (ground up fish and crustaceans) and away from terrestrial animal protein. 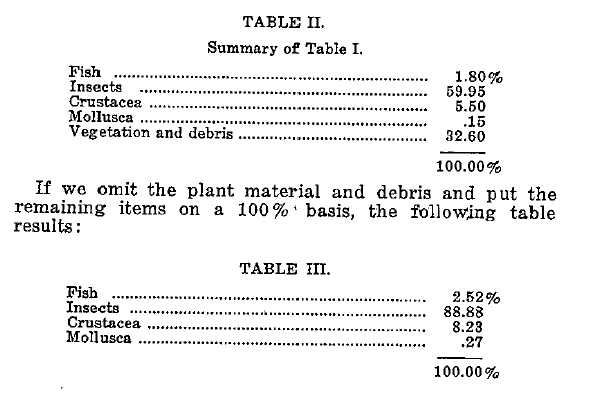 Experiments were continued by the Bureau of Fisheries with a variety of species. 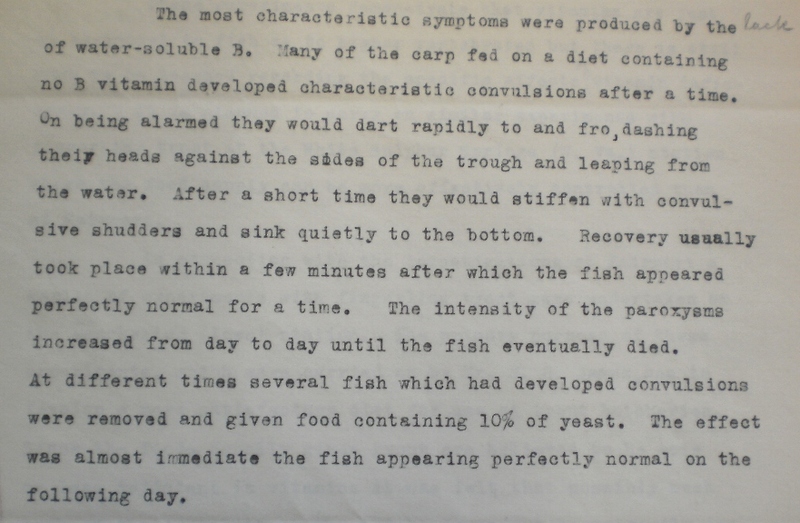 Yearly pathology reports from Davenport, IA show continued research with carp, trout, and bass throughout the 1920s. Of particular interest was the impact of specific vitamins on the growth and behavior of young fish. Withholding water soluble B and C resulted in 45-67% mortality for all the fish. Withholding B resulted in fully grown fish who experienced trouble swimming due to convulsions. Withholding C resulted in white lesions on the fins and eventual death. 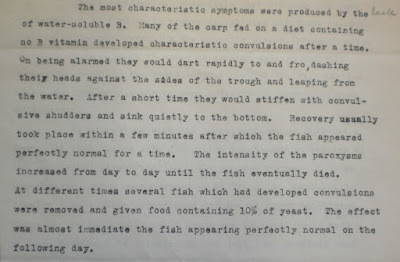 Generally, these experiments (detailed in the National Archives Record Group 22 Fish Pathology and Pollution of Fishery Habitat, 1903-32) showed that vitamin deficiency was a major cause of pathology in farmed fishes and that feed was probably the most important variable to calibrate for the effective farming of fish stocks. Through the Davenport, Iowa experiments (and the subsequent work at Manchester, IA and other USBF stations in Ohio, Virginia, Tennessee, and Colorado) fisheries biologists developed industrial fish pellets or biscuits that contained all of the vitamins and nutrients required for health fish that grew quickly and maintained health. For freshwater fishes, the process of feeding, and developing feed, was one of trial and error because there was such a wide array of natural food consumed by the fishes. Trout consumed crustaceans, microscopic zooplankton, decomposing plant matter, and insects. This meant that their wild diet was relatively varied and didn't constrain their farmed diet as much. Fish biscuits and pellets contained primarily fish meal with added vitamins, and were generally held together with grains such as wheat or corn. 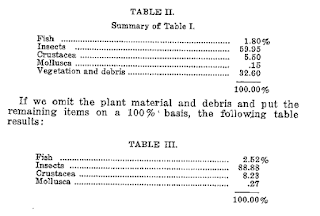 As the market shifted over the 20th century, the more expensive components could be replaced by cheaper feed as long all the vitamin requirements were maintained. Today, because of the expense of fish meal, researchers have been working to develop entirely plant based fish pellets for farmed fishes with mixed results. While plant based pellets satisfy the nutritional requirements of the fish, it apparently results in a reduced appetite and feeding from the fishes and therefore a slower or plateaued growth rate. For now, fish meal is an integral portion of the diet of farmed freshwater fishes. But the amount consumed by freshwater fishes is minimal compared to that needed to farm saltwater species. To feed these fish, much larger amounts of fish meal is required. I'll talk about saltwater species and the global impact of fishmeal trade my next post.